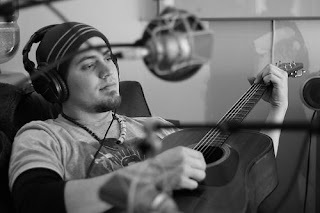 "Jordan Page is a young singer/songwriter/guitarist who uses his music to promote a message of peace while educating and mobilizing resistance to tyranny and the erosion of American civil rights. He embodies the protesting spirit of past years that is so rare in music today. He believes that armed service is not the only way to serve one’s country. Armed with the truth in song, he has raised up his voice in opposition to extreme military foreign policies, the corruption of the Federal Reserve, subversion of the Constitution and the Bill of Rights, torture of prisoners, warrantless domestic surveillance, and oppression perpetrated by globalist elements in government. His songs are often stirring, and always challenging. Jordan was a featured performer at the historic Revolution March in DC in July 08, which featured Ron Paul, Naomi Wolf, and Adam Kokesh as speakers and was attended by more than 10,000 people from across the nation. This event was proof of the gathering strength of the Freedom Movement, and the need to bring its message to the American public. Constantly on the move, Jordan is affiliated with, has appeared on, or is endorsed by a multitude of political advocacy groups, publications, and radio stations including Restore the Republic, Polygraph Radio, Oracle Broadcasting, XM Radio, WRNR Radio Annapolis, WORT Radio Madison WI, VH1 Channel One, Liberty Unleashed, Vigilante Radio, End the Fed, American Vigilance Coast to Coast, Progressive Radio, Future of Music Coalition, Free Press, and the Huffington Post. Music is a powerful vehicle for social/political change, and with the homogenization of radio, increasing corporate control of mainstream news outlets, and the climate of fear that stifles our society, quality entertainment with real message is lost. Jordan Page is a new, clear, and committed voice who can bring the message of the Freedom Movement to a whole new audience with compelling songs of hope, protest and peace." Jordan Page is what this Directory is all about... Finding, promoting and being approached by talented and independent truth speaking artists. We are at the start of a revolution and our Truth Movement has a soundtrack! Jordan will be starting a national college tour on February the 12th @ the Students For Liberty international conference at American University in DC. Please check his websites for more info, songs and videos!